Uniquely, Toolcraft can further increase the life of your tool by locally Nickel Cobalt plating it to Rockwell hardness 55. For a complete overview of the advantages of aluminium alloy tools see our Alloy vs Steel Tool Comparison Chart. Here at Toolcraft we've made 600+ alloy mould tools helping firms like yours get high quality tools & precision mouldings fast and at low cost. Our experience of the properties of alumium alloy tools enable us to guarantee how many mouldings your tool will make. Our other tool options include: steel mould tools, chinese mould tools and insert only mould tools. Why choose Toolcraft For your Aluminium Alloy injection mould tools ? Our tool design+manufacture software can import a vast array of file types to eliminate some design and production time normally required. 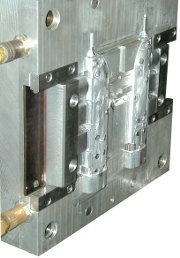 This way we can offer you rapid production of injection mould tools at much lower cost, saving you time & money. Our mould flow analysing software shows us in detail where air trapment and hotspots might arise, where the weld lines will be and much more. This means we can catch those issues before they ever arise, saving time & cost again. We include this service for free with orders for mould tools.